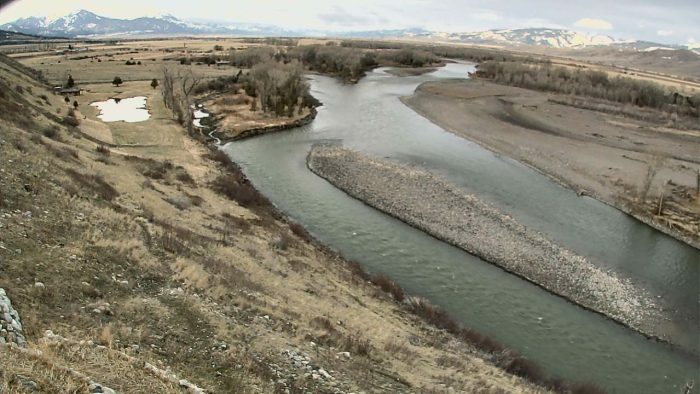 Sweetwater Fly Shop’s Dan Gigone, out of Livingston, has some footage of a nice trout he caught and released on the Yellowstone River last week. Here’s what the Yellowstone is looking like as of Sunday, April 15th, and to read the full report, click here. The fishing on the Yellowstone River has been spotty lately, to be honest. I think that the big weather swings we’ve been having lately, and the accompanying swings in water temperature and clarity, have kept the trout from really getting settled in. But more consistency over the last few days, and in the forecast, should get them eating. As you can see from this morning’s photo from near Pine Creek, the water is currently green with a tinge of milkiness. But there’s definitely enough visibility to get fish on nymphs and streamers. Just a short clip of a moderately-sized (but beautiful) rainbow trout that I caught and released on the Yellowstone River a few days ago. The river’s green with a tinge of milkiness this morning, but plenty of visibility to get fish on nymphs and streamers, and more consistent weather should get the trout going strong on the feed.